LAKE VILLA, Ill., Feb. 6, 2018 – By its very nature, the label manufacturing process can produce a fair amount of waste, from set-up material and edge trim to matrix and container waste. Unfortunately, it’s estimated that 85 percent of label industry-specific waste is sent to landfills each year. As one of the nation’s leading manufacturers of custom barcode labels, ID Label is furthering its commitment to green manufacturing practices. ID Label produces more than 500 tons of waste each year. 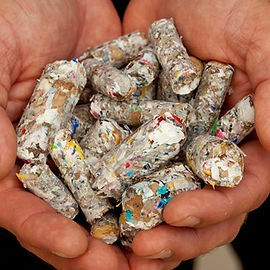 By working with Convergen, that waste is converted into alternative energy—fuel pellets—which can be used as a substitute for coal, gas and other fossil fuels. ID Label’s Lake Villa manufacturing facility is also LEED certified by the Green Building Council. LEED (Leadership in Energy and Environmental Design) is a framework to create healthy, highly efficient and cost-saving green buildings. Since 1994, ID Label has been one of the nation’s leading manufacturers of custom, variable-information barcode labels and asset tags. The company’s solutions are used by thousands of global organizations to keep their businesses moving with efficiency, speed and accuracy. Our expert sales consultants are passionate about working with our customers to provide smart ideas and innovative products. With the industry's most advanced digital technology footprint, we provide custom design engineering, production, signage and installation services for organizations in the warehousing, supply chain, manufacturing, electronics, calibration, library, laboratory and other markets. To learn more, visit www.idlabelinc.com.